So the naan pizzas are close to my favorite thing on earth but even one piece of that is over 100 calories. Yes, it may seem kinda like eating a burger on a big slab o lettuce, killing all the joy from burger eating, but I'm telling you, if you get it right, a "no carb" pizza is soon rewarding. And so much more nutrients come from using cauliflower and zucchini than just a gluten free crust. It saves a lot of calories and let's face it, I'll take my extra calories and carbs from wine, thank you. If you don't have a food processor, hmmm..... I'm not sure what to tell ya there. Okay here's the process which is a bit tedious but I cannot find a way to avoid all the squeezing. 1. process the cauliflower and zucchini. 2. Boil it all in a bit of water in a pot for about 5 minutes. add some salt. 3. Drain as much as possible and place on a cheesecloth (which for some reason I continue to forget) or a clean non fuzzy dish towel. 4. Let it cool, then squeeze the hell out of it until there's virtually no water. That's the crappy part, but the more you squeeze, the more it'll hole up! Also -try cooking on a holed pizza pan which will make it crispier. 5. Put in a bowl and mix all other ingredients. 6. place on a greased pizza pan (or on parchment like many recipes call for), and bake at 400, 25 minutes. For the toppings, do whatever the heck you want! I treat this pretty much like naan pizza night. Right now it's focused on fresh tomatoes, basil and peppers from my garden! They are abundant and awesome. Fresh mozzarella and feta. I also have on hand pepperoni and other cheeses for the 9 year old boy. 7. 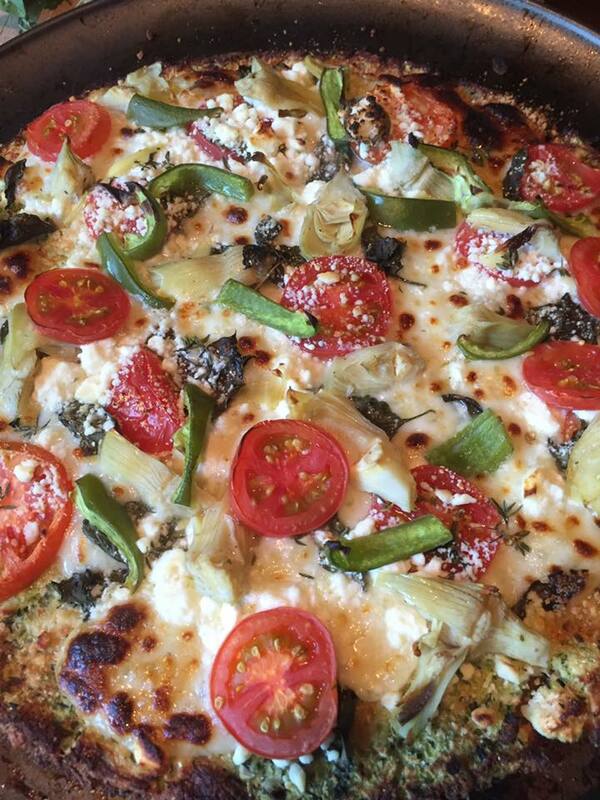 Add then add toppings, and bake another 10- 15. I like to do a quick broil to crisp it up. It smells amazing and can look as pretty as you want! You can also use this for a simple bread or bruschetta! Have some red red wine and pretend you're eating tons of carbs!